For 70 years, the issuing of government food guides in Canada has been about more than just nutrition and health. One historian has found that they have been used to advance "particular political and professional interests." For 70 years, the issuing of government food guides in Canada has been about more than just nutrition and health. 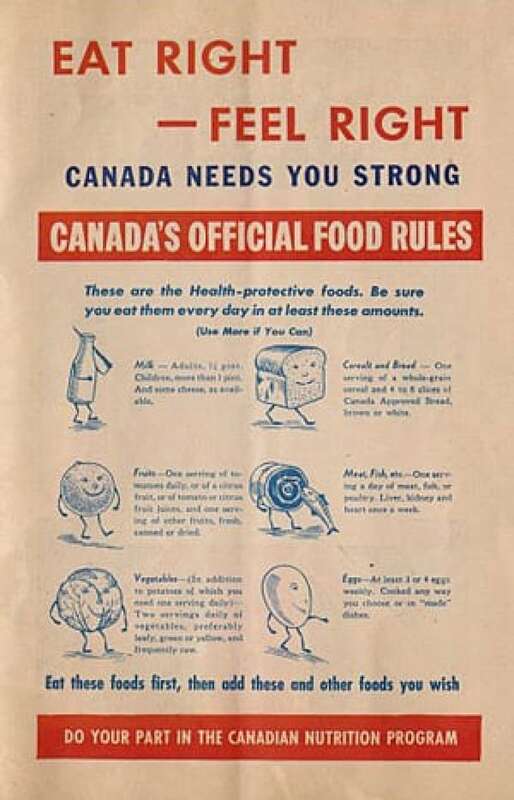 The first Canadian government food guide debuted in July 1942, and reflects its Second World War origins. 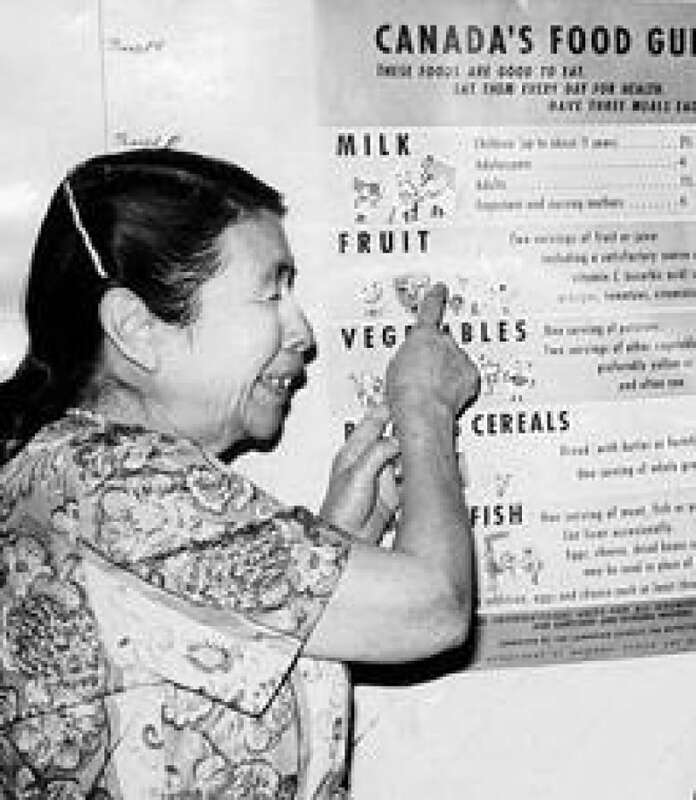 Then called Canada's Official Food Rules, the guide was written to address the crisis of widespread malnutrition revealed by a series of studies. Poverty was the main cause. It was shortly after the Great Depression, a time when government, in order to save money, had set the levels of relief rations well below nutritional adequacy. One of the studies, conducted in Toronto, found that only three per cent of families were consuming sufficient calories, and only seven per cent were getting enough protein. Across Canada, over 60 per cent of people had inadequate nutrition, and that was a challenge for the war effort. Over 43 per cent of the first 50,000 military recruits had been rejected for medical reasons. Historian Ian Mosby has studied the food rules of the 1940s and found that they were used to advance "particular political and professional interests by defining healthy eating in a way that prioritized a certain vision of the wartime labour, military, and agricultural needs of the nation." They were "part of a campaign that was less about preventing disease than promoting strong soldiers, efficient workers and good mothers," Mosby told CBC News. The food rules were part of a major government effort to transform Canadians' diets, which included discouraging people from eating some foods that were needed for wartime export and encouraging the consumption of foods that did not meet that bill, like lobster. A year before the release of the Official Food Rules, Saturday Night magazine, which backed the campaign, ran a story headlined, "Canada's Faulty Diet is Adolf Hitler's Ally." In another Saturday Night story, from December 1942, Anne Fromer wrote, "Canada has determined to change the eating habits of a nation." Producing food efficiently was "only half the victory," she wrote. "It takes efficient consumption, too, to give full meaning to the slogan, 'Food will win the war.'" This is well illustrated by the Canada's Official Food Rules image on the right. It comes from a 1942 booklet published by the meat company Swift Canadian titled Eat Right to Work and Win. Swift, an American company, also published a well-known U.S. version. Both editions include famous comic strips from the era. The booklet has slogans like, "Canada needs you strong" and "Do your part in the Canadian nutrition program." The drawing beside the description of dairy consumption shows a rifle-toting milk bottle. During the war, Canadians did eat more, although perhaps not resulting in the creation of "a race of super-Canadians," as a 1943 Saturday Night editorial predicted. The editors wrote that the food program, "is going to effect what is probably the most radical change in the living habits of a nation that has ever been brought about by the conscious effort of its rulers and its scientific and intellectual leaders." 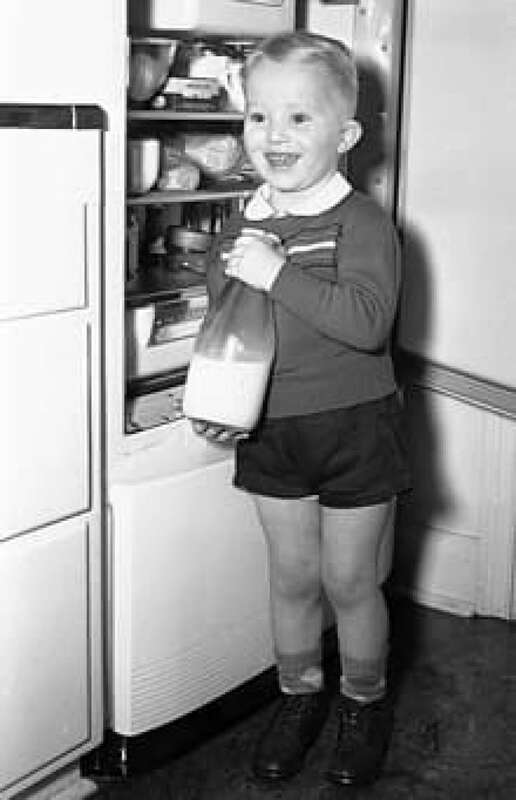 The 1944 edition of the food rules dropped "Official" from the title and based the recommendations on 100 per cent of the dietary standard set by the Canadian Council of Nutrition, even rejecting a recommendation from the Department of Agriculture not to increase recommended milk consumption, because of a scarcity of milk in 1944. Mosby writes that "the Food Rules closely mirrored the interests of Canada's main domestic agricultural producers," and the promotion of agriculture was one of the central goals. If the Canadian diet was based on the food rules of 1944, domestic consumption of milk, fruits, vegetables and whole grains would have been about 25 per cent higher. According to Mosby, the food rules had little application to some Canadian regions, especially the north, and "also stigmatized culinary traditions of ethnic groups" that did not centre around dairy products. In a contribution to the book Edible Histories, Cultural Politics, to be published in December, Mosby argues that the program "was premised on the notion that good nutrition was a personal rather than collective responsibility" and that the proper feeding of the family was "an essential duty of wartime citizenship" for mothers and wives. The 1949 food rules were based on a new dietary standard that was quite similar to the previous version, even though warnings of over consumption of food were already more common. The dietary standard did hint that more was not necessarily better, but this was related to the persistent world food shortage rather than the harm of excess consumption, an issue for food guides to this day. The rules did not contain advice about not eating particular foods. The next rewrite was in 1961, with the title now Canada's Food Guide, but that edition, as well as the 1977 and 1982 editions, were not substantially different from the 1949 version. The 1992 food guide marked "a new era in nutrition guidance in Canada," according to Carmen Connolly, then the chief of the Nutrition Programs Unit at Health Canada. The title changed to Canada's Food Guide to Healthy Eating and the design changed to a rainbow graphic to display the four food groups. The major change was a shift in philosophy to a "total diet approach" for meeting both energy and nutrient requirements, replacing the minimum requirements approach of earlier guides. When the draft guide was sent out to food industry groups for comment, they didn't like what they saw. There is no recommended number of servings for these foods since they have little nutritional value. They provide taste appeal but are often high in fat and calories. The less you eat of these foods, the better. The Grocery Products Manufacturing Council found it disturbing "that 'extras' continue to be presented negatively and inappropriately, creating a good/bad food scenario." Taste and enjoyment can also come from other foods and beverages that are not part of the other four food groups. Some of these foods are higher in fat or calories so use these foods in moderation. The Canadian Meat Council complained that the "meat and alternatives" group included "only 1-3 servings per day, which may be interpreted that one should be careful in eating meat when viewed in the context of 4-10 vegetable servings." The guide was revised, upping the recommended meat and alternatives servings to 2-3. After the Dairy Bureau of Canada and the Canadian Egg Marketing Agency both objected that the proposed guide had reduced the number of servings of their industry's products, that number was also increased in the final version. CBC Marketplace co-host Bill Paul told viewers in 1993, "The outcry was enough to make one think that the four food groups should be renamed the four lobby groups." Connolly told Paul, "We didn't do everything they asked." It would be another 15 years until the next - the current - edition of the food guide was released. The revision process began in 2003. Health Canada appointed a Food Guide Advisory Committee, with four of 12 members from the food industry. Although the committee included nutrition and health experts, critics argued that a food guide should be based on science and medicine and not business interests. "I can't think of anyone with greater conflicts of interest in the creation of a food guide than the folks who sell and promote the food," wrote Dr. Yoni Freedhoff, medical director of the Bariatric Medical Institute in Ottawa, in 2006. Mary Bush, then in charge of nutrition policy at Health Canada, replied at the time, "philosophically, we absolutely believe that if we’re going to improve the nutritional health of Canadians, it takes all sectors to... understand their role." Bill Jeffery of the Centre for Science in the Public Interest in Ottawa, noted in an interview with CBC News that with food guides, food companies "have a very high vested interest in ensuring that the advice furthers their commercial objectives." "They sure as heck don't want advice to consume less of their food in there," he added. In a recent interview with CBC News' Melanie Nagy, Bush, who's now retired, argued, "What the food guide does, is lay out a pattern of eating based on the best evidence we have about what matters for health in terms of adequate nutrients, as well as trying to limit excess to prevent chronic disease." Freedhoff and Jeffery are both critical of the guide for what it leaves out: strong advice to use much less salt, eliminate trans fat and the dangers of overeating. The guide does advise Canadians to choose products that contain less sodium and less trans fat. Freedhoff, an obesity expert, says that following the food guide would cause weight gain. Leslie Carson, the manager of food and nutrition services at St. Joseph's Health Centre in Guelph, Ont., told CBC News that, with a patient population of mostly seniors, the hospital doesn't follow the food guide because the oldest age group covers people 51+, and someone who's 81 normally should consume significantly less food than a 51-year-old. Bush explains that because "we have major problems with weight in this country, today's Food Guide is really quite different in its focus" than the food guides of the 1940s. "But the same principles underlie it: this is a pattern of eating; if you follow it you can be assured of having the best that science can provide today," Bush says. Despite his criticisms, Jeffery defends the food guide as a buffer against other messages. "It is an important bulwark against the types of nutrition advice — if you want to call it that — that we see in commercial advertising and a lot of the fad diets," he said.